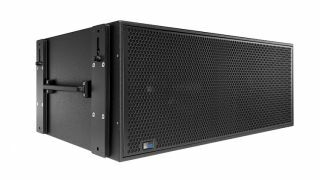 Meyer Sound has begun shipping its VLFC very low-frequency control element, the latest addition to Meyer Sound’s LEO Family of line array systems. VLFC is a large-scale loudspeaker system specifically engineered to create visceral impact at frequencies below the threshold of hearing. By focusing energy into a narrow band between 30Hz and 13Hz, VLFC is capable of generating extreme variations in air pressure that are sensed by the entire body as compression waves while those frequencies at the upper end of its range are perceived as thunderous bass sound. The VLFC is a self-powered system housing two low resonant frequency 18-inch cone drivers. The onboard power is supplied by a two-channel Class AB/H bridged amplifier with complementary MOSFET output stages for high peak power and clean transient reproduction even at extreme operating levels. Cabinet porting and internal baffling have been optimized to deliver maximum acoustic output in one octave that extends across the lower limit of human hearing. The VLFC shares the same exterior footprint as Meyer Sound’s 1100-LFC low frequency control element, allowing use of the same rigging grids and caster frames. When the VLFC is paired with the 1100-LFC, the combination produces linear, coherent bass response from 13Hz to 100Hz. Applications for the VLFC include adding very low frequency, visceral impact to hard rock and electronic dance music in concerts, festivals, and clubs. The VLFC also adds explosive impact to special effects in cinemas, themed spectacles, and theme park attractions. A limited early production run of VLFC elements was supplied for Metallica’s ongoing Worldwired tour, where as many as 42 VLFC cabinets created a forceful impact that was felt throughout large stadiums.